KOKOMO, Ind. — Indiana University Kokomo graduates will be ready for jobs in the growing green industry, with a new diploma track in earth and sustainability sciences. Professor Leda Casey informs students how to apply their knowledge in the field. 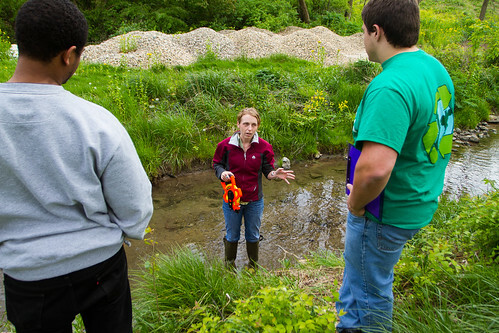 The program is a specialty track for biological and physical sciences majors, with a focus on fieldwork, hands-on experiences, and an in-depth understanding of how the sciences interconnect with the environmental industry. Leda Casey, lecturer in geology, said planners researched environmental companies in Indiana and talked to leaders at the Indiana Department of Environmental Management, to design a program to prepare graduates for jobs in the field. "They want students who have a lot of hands-on field experience, and experience with technology, and who understand the connection between biology and the environment. This is very much a growing field, in Indiana and globally. There is a huge demand for people with this background, especially if they have experience doing environmental investigations prior to finding a job." According to the Bureau of Labor Statistics, the demand for environmental scientists and specialists is expected to increase by 28 percent by 2018. Graduates would be prepared for graduate school or the job market, in careers including laboratory work, teaching, environmental consulting, or government environmental management. Students may enroll in the track for the fall semester, which starts Monday, August 20. Christian Chauret, dean of the School of Sciences, said the fieldwork component makes this track distinctive. "We are preparing students to not only understand the science behind the environmental and sustainability issues facing our world, but to have a broad exposure to the field work involved in collecting data related to the ecosystem and resource conditions," he said. Marcia Gillette, senior lecturer in chemistry, expects the track to be popular among biology majors, because the environmental sciences classes currently offered are usually full with a wait list. "Students are aware of our environmental issues. They are concerned about what we are doing to the planet so their grandchildren will have a world to live in like the one we have today," she said.